The Woolrich Perry Denim Comforter Set adds the casual comfort of your favorite pair of jeans to your bedroom decor. Overfilled and oversized for incredible warmth and softness, the comforter features a classic denim design on the face and a solid blue cotton percale reverse. The two decorative pillows have removable covers with zipper closures. 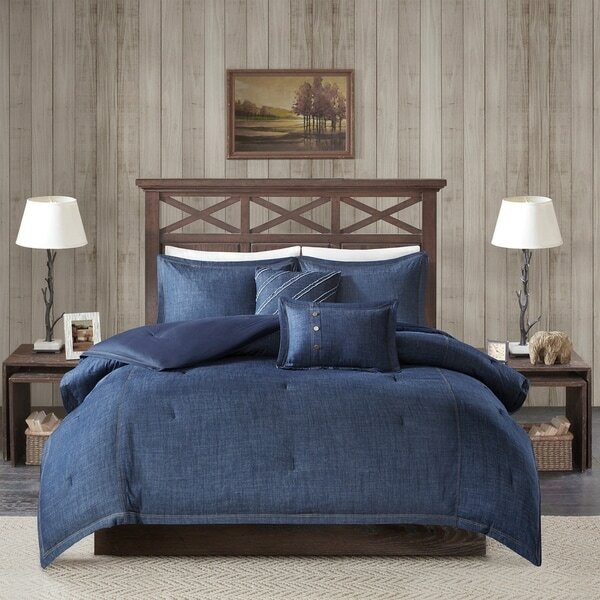 This denim comforter set is made from all cotton and is machine washable. This is an amazing bedroom set. It is definitely overfilled which is exactly what we wanted. It looks very nice on our son's industrial styled bed. The three throw pillows that come with the set are great and are a great addition to the set. The comforter is made with a nice light/medium weight denim that lays perfectly on the bed. The comforter is heavy so you might find in the summer time that you will want to pull it off in the middle of the night, but in the winter, it is going to be very cozy. We don't mind pulling the comforter back at night during the summer, as my son is a hot sleeper and usually sleeps just under a flat sheet. If you are looking for a high quality, overfilled comforter, this is the one to get. It is excellent quality. I very highly recommend. True to the color in the picture. Pillows, shams match photo exactly. The comforter is fluffy and warm just like I wanted. The fabric is sturdy and well sewed. The underside of the comforter is not denim so it is not reversible but I’m okay with that. The demin fabric fit my decor exactly as I’d hoped. It’s a classic set that will last for years to come. Very satisfied. This is the perfect dark denim comforter! I searched and searched for the perfect dark denim or chambray set, but only found cheap, juvenile looking sets. The quality is amazing and the size is large enough to fit the bed with beautiful drape. The shams are beautiful and the set comes with 2 throw pillows that my daughter's instantly swiped for their rooms. The weight is heavy and the set is true denim, not "denim look" and the same material is used on both sides instead of just the top side that shows. Love this set! Just like having your favorite pair of jeans, soft and comfortable. Great with colorful throw pillows. The comforter and pillows are great quality, and just like the picture on-line. I am extremely happy and would recommend this to anyone who wants a denim decor. With other coordinating blue accents, the room is amazing. I love this comforter! It’s light weight but it’s warm. The dark blue denim is the perfect color for my room and the quality of this set is A+. We’ve got a split king and this comforter fits great. Love this comforter set! The extra pillows are an added touch. Made well and picture is accurate. Great comforter! My son loves the true denim top of this comforter as well as the medium weight. The color of the denim is slightly darker than appears in the photo. I really like this set. It’s a great unisex compromise. It fits very well for a king. It may be a bit short on a Cali king. It is as puffy and plush as I was expecting but still has a really pretty look. One of the throw pillows buttons came very loose and dangling. All in all it’s a nice set. I’m happy with it. Thick and made well. Makes my son’s bed look polished. Very nice! Pretty good quality better than I expected! My wife was looking for something that was durable and long lasting. Appears to be exactly what she was looking for. Good fair price and was delivered on time and put to use. Product has great quality and it is not heavy. The color is beautiful. "Is this comforter double sided Denim for the king sized?" I wanted something unique an this caught my eye! To match a painting for my guest bedroom.